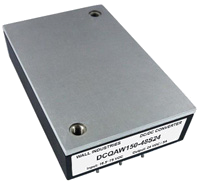 The DCQAW150 series of DC/DC power converters provides up to 132 Watts of output power in a 2.28” x 1.45” x 0.5” industry standard quarter-brick package. This series has single output models with 4:1 wide input voltage ranges of 8.5-36VDC, 16.5-75VDC, and 40-160VDC. Some features include high efficiency up to 90%, 2250VDC I/O basic insulation, and remote ON/OFF control. These converters are also protected against input under voltage, short circuit, over voltage, over load, and over temperature conditions. All models are RoHS compliant and have UL60950-1, EN60950-1, IEC60950-1, EN45545-2 and EN50155 safety approvals. Several different options are available for this series including negative logic remote ON/OFF, heatsinks, and thru-hole inserts. Notes: 1. Input Source Impedance: The power modules will operate to specifications without external components, assuming that the source voltage has very low impedance and reasonable input voltage regulation. Highly inductive source impedances can affect the stability of the power module. Since real-world voltage sources have finite impedance, performance is improved by adding an external filter capacitor. - For 24VDC & 48VDC input models we recommend using Nippon Chemi-con KY series, 100µF/100V. - For 110VDC input models we recommend using Ruby-con BXF series, 39µF/200V. 2. Maximum output deviation is +10% inclusive of remote sense and trim. If remote sense is not being used the +SENSE should be connected to its corresponding +OUTPUT and likewise the -SENSE should be connected to its corresponding –OUTPUT. 3. 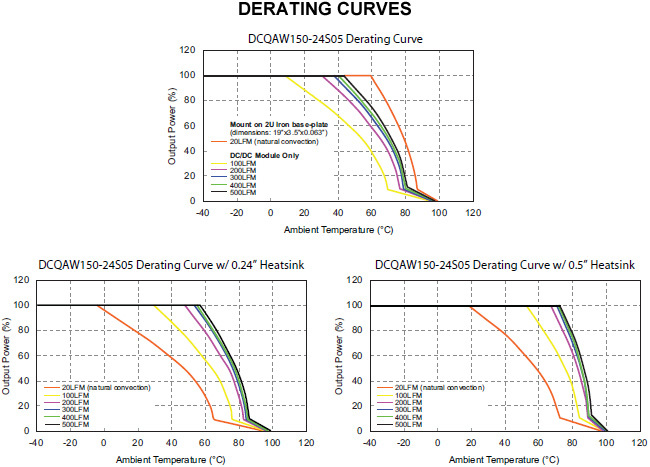 The DCQAW150 series can only meet EMI Class A or Class B with external components added. Please contact factory for more information. 4. An external input filter capacitor is required if the module has to meet EN61000-4-4, EN61000-4-5. - For 110VDC input models we recommend with 3pcs of aluminum electrolytic capacitor (Ruby-con BXF series, 100µF/250V). 5. Both positive logic and negative logic remote ON/OFF control is available. Positive logic remote ON/OFF comes standard; for negative logic remote ON/OFF add the suffix “R” to the model number (Ex: DCQAW150-48S24R). 7. M3 x 0.5 threaded-thru inserts come standard. 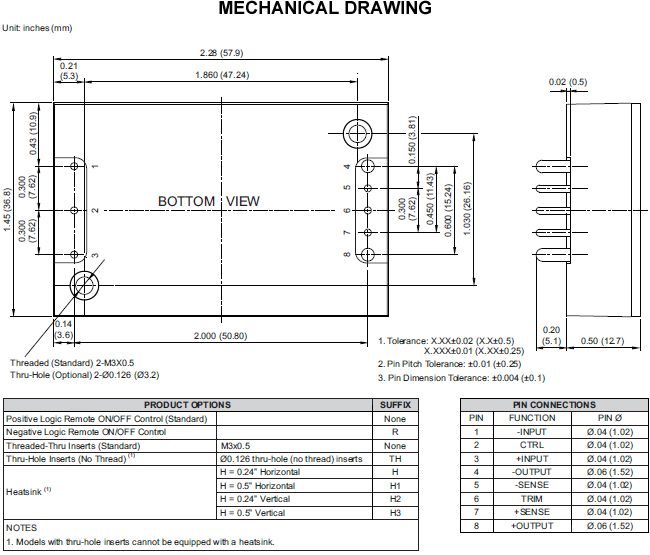 For Ø.126 thru-hole inserts add the suffix “TH” to the model number (Ex: DCQAW150-48S24TH). 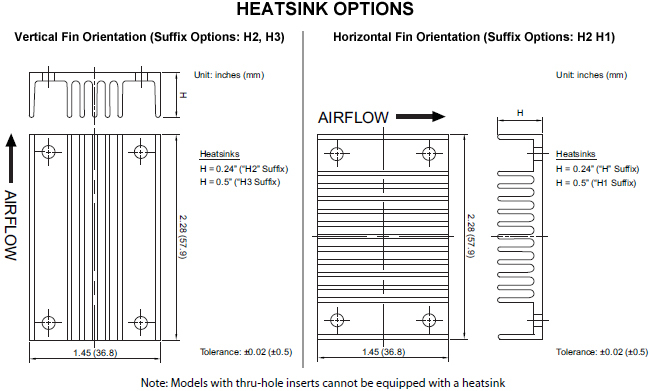 Models with thru- hole inserts cannot be equipped with a heatsink. 8. BASE-PLATE GROUNDING: EMI can be reduced when you connect the case pin and the four screw bolts to the shield plane.